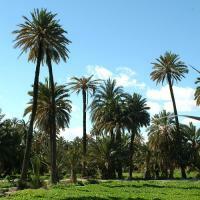 The Palmeral of Elche is an oasis-like landscape of date palms, transferred to Europe from North Africa by the Moors. It was constructed during the Arab occupation of this area in Spain over 1000 years ago. The inhabitants of Elche used well known techniques from the Near East and the Sahara-region to let this desert bloom. The site consists of 67 different palm groves. They contain more than 11,000 palm trees, mostly date palms (Phoenix dactylifera), with individual specimens up to 300 years old. Close to the notorious holiday resort of Benidorm, where I was staying with acquaintances of my parents, I found this little treasure. The surroundings are almost like a desert, but thanks to the clever irrigational system a palm tree forest survives. When I visited the site in 1987, it hadn't reached World Heritage status yet. To be honest, at that time I didn't know about the UNESCO World Heritages either, so Elche is recorded in my memory only as a nice daytrip. I visited this WHS in March 2016. I spent 2 nights in Elche and a full day exploring the different parts of the Palmeral. The whole Ruta del Palmeral is around 5km but it is quite worthwhile as there are a number of cafes or benches to stop to relax or grab a coffee. It starts and ends at the Huerto de San Plácido which has a Unesco sign and a map of the trail next to the entrance. In all there are 20 groves with a total of 200,000 trees and 70,000 date palm trees. Some are relatively new and are not part of the inscription. The best viewpoint is opposite the bridge next to the Palacio De Altamira moorish fortress and the blue-domed Basilica de Santa Maria. Although when walking the trail, the Palmeral seems like a huge park or garden, it was originally a plantation with an agriculture purpose, and thus its plots (huerta) are referred to as groves. Each of the groves is flanked by rows of date palm trees, in such a way that, when viewed from the air, they form a grid pattern. The origins of the palm grove date back to the tenth century, when the Arabs relocated the city to its current site. During the Ruta del Palmeral you'll visit the Palm Grove Museum which will help to give you a context to better appreciate the site. Moreover, you will see several palm trees with different shapes and forms, mainly at the municipal park (free) and the Huerta del Cura (5 euro entrance fee), a botanical garden with several cacti, peacocks and other birds. The most popular one is the 7 branched Imperial Palm tree (picture) which is almost 200 years old. 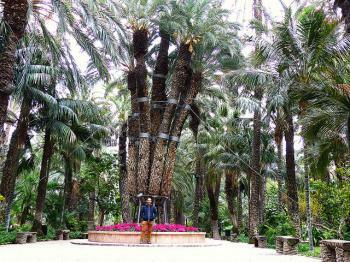 Recently the red palm weevil parasite killed as much as 20,000 palm trees in Elche and one of the 7 branches of the Imperial Palm tree had to be trimmed off. However, authorities seem to have kept the situation under control and slowly but surely more palm trees will grow. 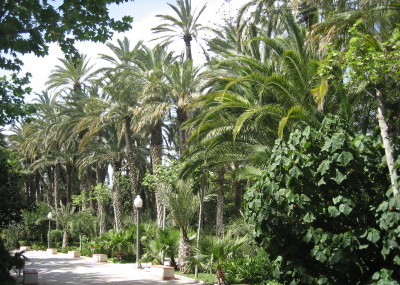 The Palmeral of Elche is quite unique in Europe and is the northernmost of its kind worldwide. The Huerta del Cura reminded me of the Yves Saint Laurent Gardens in Marrakech which have a better cacti collection. Overall, I failed to grasp the OUV of this site even though it's worth visiting if your nearby. This is a really interesting and unique site to visit - a true oasis in a very desert-like landscape in southeastern Spain. The moment you step out of Elche's train station, you are surrounded by palms of all kinds, shapes and sizes. The Municipal Park between the station and the tourist office features a large variety, but the most important and famous sight of Elche is the Huerto del Cura, a very nice botanic garden with ponds, statues, etc. The nearby San Placido garden includes a small, but interesting museum about the history and biology of the palm trees. Elche is quite a pleasant city with several interesting sights in the Old Town. If you have been to Granada and the Alhambra already, you have seen the major testament to the Arabs' centuries-long occupation of the Iberian peninsula. The Palmeral is probably the second-most important Arab monument in Europe, and definitely worth a visit. After exiting the Elx Parc station and visiting the Tourist Office, I followed the walking tour described in their pamphlet, around the Parc del Filet de Fora. Here I found trees and aflaj (irrigation channels) similar to those in Oman and Al Ain (UAE). About two thirds of the way around the tour I stopped for an excellent salad lunch at the Santa Fe cafe. The Palmeral of Elche is an great example of Arab agricultural practices on the European continent. 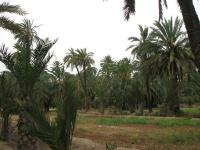 In our trip to Spain we have been to the Palmeral of Elche, the most important complex of date palm groves in Europe, laid out by the Arab Muslims at the end of the 10th century as an oasis, a system of agricultural production in arid areas. The city of Elche and its centre are completely surrounded on the east by an incredibly large and continuous area of palm trees (some higher than 30 metres and older than 300 years), interrupted only by main traffic roads. The palms are everywhere, touching the houses of the outskirts and also inserting in the middle of them. First we stopped at the Tourist Office where they have many information about the Palmeral, near which there are beautiful views of this “sea of palms” from the bridges over the river Vinalopó. In the middle of the Palmeral there are four places, of which we have seen two, regarded as the most interesting features, mainly parks. First we went to the Municipal Park: here you can have a pleasant walk on gravelly paths in the middle of palms. The small park is laid out exactly like an urban garden with all its facilities, with palms combined with a lot of other species of plants, often flowering, situated in modern flower-beds. Then we have been to the Huerto del Cura, a park similar to the Municipal one, but finer and comparable to a small botanical garden (the ticket for which is highly overpriced – 5 Euro), also with palms combined with other species of plants (cactuses, flowers…), but containing also fountains, statues, modern sculptures... The most interesting feature is the Imperial Palm, more than 200 years old, the trunk of which is separated into 7 arms. However this garden design of the palm groves as urban parks or botanical gardens is seen by me as diminishing the authenticity of the Palmeral, although enhancing its state of conservation. However the major part of the Palmeral isn’t constituted by decorative palms, but by those used for the production of dates or palm leaves, laid out in polygonal plots bounded by fences and irrigated by canals. This arrangement is probably original and unchanged from the Arab times, so it is much more authentic than that of the parks; but it is clearly difficult to maintain them in a good state of conservation and keep them clean and you can see this in place. However, in my opinion, this type of grove is really the most interesting feature of the Palmeral. There is also a 2,5 km long itinerary between this palm groves, starting from the Huerto de San Placido in front of the Huerto del Cura, about which you can find information and maps in the Tourist Office and on the Spanish web page http://www.turismedelx.com/es/rutas/2/. However, we have seen only a small part of this because it was raining. This WHS is certainly not a classical type of destination for a tourist or a place where one could see extraordinary features, but it is much original and specific and especially for this reason it was interesting. It is not worthy of a long travel for visiting specifically it, but certainly it is worthy of a visit if you are in Spain for a longer holiday. It certainly justifies its inscription on the WHL not only because it is the largest palm grove in Europe, but above all because it is the only case of transposition of an agricultural system from one continent and culture to another one. In the picture you can see some palms in the original palm groves and the delimitations of the plots on the ground. A beautiful park. I was mesmerised. If you're in the area it would be terrible not to visit. All ages could appreciate the tranquility.